Some of you may have been wondering if I dropped off the edge of the Earth, since the blog has been completely silent for several months. Well, I am here to say that no, I did not drop of the edge of the Earth. Nor was I eaten by a sea monster. Or abducted by aliens. working hard at work as usual, but we hired a SECOND programmer, so finally so help and someone to bounce ideas off of! saw Tears For Fears in concert here in Nashville – DREAM COME TRUE! Fabulous concert! my daughter turned 16 in July. She also spent a week at the Savannah College of Art and Design for a summer program. That meant two quick, non-relaxing down-and-back trips to Savannah, but at least we got a little time at the beach. one of my friend’s introduced me to YNAB (You Need A Budget – youneedabudget.com). For anyone struggling with finances, this tool is amazing. Judging from that list, it seems that lots of good and exciting things have been happening to me, so how could I possibly be depressed? Well, that’s why I finally went to the doctor. We have not done a lot of renovating or decluttering since I finished The Great Coat Closet Remodeling Project. (Side note: we love, love, love the closet!) 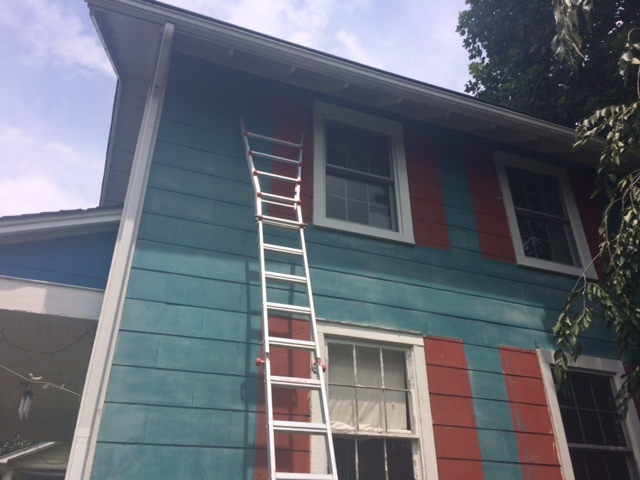 We decided that our new priority is to finally finish painting the outside of our house. Our plan was to get the south side of the house completed this summer. Well, of course, it has rained practically every weekend this summer, up until the start of August. The one weekend that it didn’t rain in May, we managed to get the shutters off the house. We have been waiting since then for clear weather. August arrived and finally brought us the weather we needed. Last weekend was practically autumnal – warm but not too warm, sunny, and dry. All three of us spent the entire day Saturday outside, climbing up and down ladders, scrubbing the house to prepare for painting. The whole thing took about 8 hours. We have two ladders, but only one is tall enough to reach the upper story comfortably (i.e. without bouncing around in a terrifying manner). We had to pull buckets of soapy water and the garden hose up and down the ladder while we worked. We used Jomax to clean the house – it smells awful, but does a great job cleaning and helps prevent mildew. My daughter and I took turns on the ladder, as Steve has a little trouble with heights. Finally, the high work was done and we all three were able to finish the lower story together, just as it was getting dark. It was exhausting, but actually a pretty fun day – spending time together as a family outside in the sunshine. This weekend, the weather was not quite as nice, though it was still dry at least, so Steve and I headed out to take care of the necessary caulking and repair work. 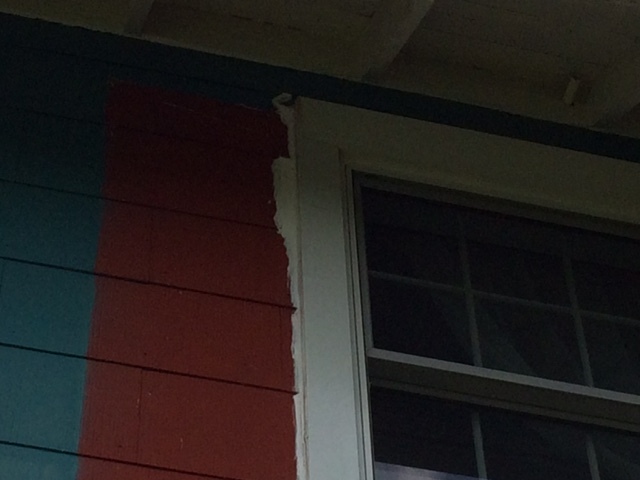 Apparently, the last time the house was painted (before we bought it), the painters just painted around the shutters. I guess our house used to be red? 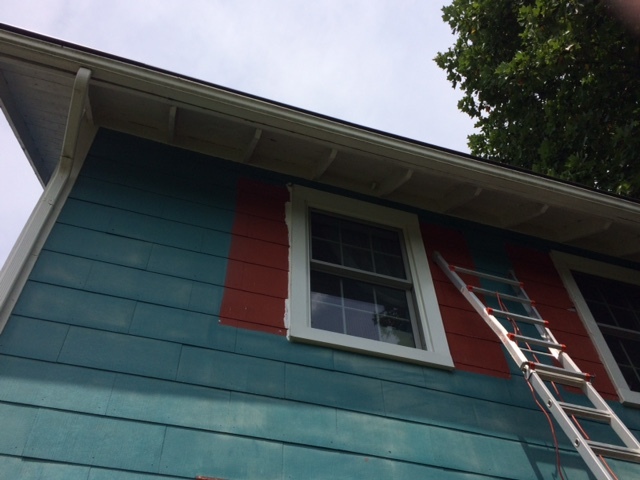 Then, when we had some of the windows replaced, the guys sealed the cladding around the windows by using an enormous amount of caulk between the window and the shutters, as opposed to the appropriate way to apply it, between the window and the house. So when we removed the shutters, most of the caulk was stripped away. There are also several places where the shingles are cracked, broken, or missing that needed a little attention. I used my mad caulking skills to caulk around the windows and fill in the cracks and broken spaces. Here is the first window, all caulked and ready for painting. 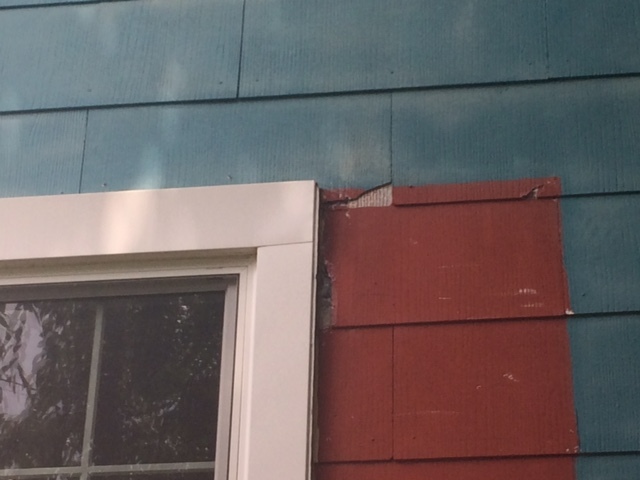 As you can see, I had to apply a wide strip of caulk just to cover the crack between the window and the shingles. The wider areas are places where I filled in missing spaces in the shingles or repaired broken ones. The caulk is paintable, so the white will not show through once we paint. So the house is all ready to be painted. Hopefully, the weather will continue to be clear on the weekends so we can complete the painting by the end of the month. A couple of more exhausting weekends up on the ladder and we should be done – with this side at least! Thank you, Emily, for your kind words! I am very glad that I finally accepted that I needed help with my depression, and saw my doctor. I can’t believe how much better I am feeling in only a couple of weeks. I am very thankful.